Today Shadow, Wilma, and I Adventured to The Meredith Sculpture Walk in Meredith, New Hampshire. The sculpture walk is an exhibit of sculptures place throughout the town of Meredith. The sculptures are created from artists in the Northeast and are located in areas including: Main Street, The Mill Falls Marketplace, and along Lake Winnipesaukee in Hesky and Scenic Parks. There are 32 sculptures along the walk. The sculptures are changed over time. We had an educational Adventure to The Meredith Sculpture Walk in Meredith, New Hampshire. I was feeling uncreative this morning pondering where to take an Adventure and was quite pleased when I located the Meredith Sculpture Walk in an online search. There was a map available online, so our journey was set! Upon arrival I was thrilled stumble on a brochure of the walk that included photos and information on the sculptures almost right where we parked. This was so helpful as trying to use a phone for a map, and photos would have been a cumbersome feat. The sculpture walk started on Main Street, soon weaving through a cobblestone store area, and crossing over the main road before beginning a walk along Lake Winnipesaukee, scenic mountains framing the Lake. The structures were overall very clear to find, and the photos on the map really helped you to spot which one was next. I posed Shadow and Wilma by many of the statues. Wilma had entertaining moments with the sculptures, in some cases being nervous, while in one case even appearing to believe statue was a real person, so excited to greet “Archie”. Shadow, having seen it all before, appeared to enjoy the walk and smells along the way, even enjoying his happy rolls. I felt like a kid again, almost like a mystery to find each and every statue. There was only one that we had trouble, but in the end located all 32. And of course, as you may guess my favorite sculptures were the animals! There were so many lovely parts to this walk besides the structures themselves. We wandered across an adorable blue bridge, and docks throughout. There were ducks along the way, benches, and some beautiful birth trees. There were beautiful flower buds about to burst, winding trails through the park, and lovely landscaping. We even found a man-made waterfall, and an over-sized patio chair, creating quite the photo opportunities. This Adventure was just perfect, on a beautiful spring day. I could not have been happier to find this amazing walk, and have a special Adventure with my Shadow and Wilma. Not only did we love The Meredith Sculpture Park, but were so pleased to learn more about the waterfront town of Meredith. We highly recommend you visit The Meredith Sculpture Park (Rating: 5). This week’s feature is an adorable photo of Buster from his FIRST trip to the beach, in Florida. He was about four months old, and absolutely loved playing on the beach and in the water. We went with friends who had two dogs of their own so Buster, Shadow, and their two friends had a blast. I unfortunately do not think I will ever figure out which beach we were at, however, it was one of the lovely dog-friendly Florida beaches. Hope you enjoy this adorable beach bum below, Buster. We sure do miss him! Yesterday Shadow, Wilma, and I Adventured to Shipwreck Ice Cream in Sandwich, Massachusetts, part of Cape Cod. Shipwreck Ice Cream is served from an outdoor window and as suggested specializes in ice cream and ice cream products. We had a tasty Adventure to Shipwreck Ice Cream to wrap-up our day of spectacular Adventures. Shipwreck Ice Cream had a large listing of flavors and of course dog ice cream for my favorite pals. Shadow and Wilma watched attentively and eagerly ready to devour their tasty treat. I decided to order a peanut butter cup frappe, venturing away from my normal couple of flavors. Once our order was complete we headed over to the nice open area with picnic tables and trees. I of course had to take some photographs before the pups savored their treats. Well maybe inhaled is a better way but either way they were quite pleased. Shipwreck Ice Cream was a wonderful spot to finish a fun filled day of Adventures (Rating: 4). Yesterday Shadow, Wilma, and I Adventured to Cahoon Hollow Beach in Wellfleet, Massachusetts, part of Cape Cod. Cahoon Hollow Beach is a large and popular beach known for its large sand dunes, and steep sandy path to enter the Beach. The Wellfleet Beachcomber restaurant is located in the parking lot area and is open during the tourist seasons. The Beach was named after the Cahoon family who lived in Cape Cod for many years. We had the perfect Adventure to the Cahoon Hollow Beach on a foggy spring afternoon. Upon arrival we parked and immediately were drawn to a stunning view. I was absolutely in awe of the beautiful and unique landscape of the beach area. Sand dunes on either side of us, and a long steep path down to the shore. We quickly jumped out of the car and were greeted by several caution signs including shark warnings, and rip current warnings. This is not at all how you expect to start a trip to the beach but thankful that it was not a day of summer heat when the water really would be a must to ALL. We then began our journey to this spectacular beach down the steep pathway, with deep, soft sand caressing our feet (well really sneakers). Somewhat of a dramatic entrance, the perfect way to reach this scenic location. Surprisingly we saw very few visitors at the lovely Cahoon Hollow Beach, which made the experience even better, alone with nature. We walked and ran along the Beach for awhile, surrounded by tall sand dunes to one side and the stunning Atlantic ocean on the other. There were beautiful shells, rocks, and even a bright yellow buoy. Both Shadow and Wilma enjoyed some digging, while Shadow relaxed in the sand and even enjoyed some rolls, one of the few visitors noting sarcastically “he doesn’t like the beach, does he?” Wilma was often on the search for shells, sometimes carrying them around and digging them up eagerly, my energizer bunny! It is easy to see the joy of dogs in life, by just watching their zest for life. They enjoy every little part of life, providing great lessons to mankind. At one point we were greeted by a group of young ladies who asked to say “Hi” to the dogs and next we knew it was about fifteen minutes of chatting and dog massages. Wilma and Shadow went from one to the next enjoying each moment of affection and kindness. They continually commented on how well behaved they were, creating a proud mom-moment. I am far from a social person and it always amazes me how people’s love of dogs builds conversations, and connects people to one another. Special creatures in our world. The only aspect that was not perfect was the worries of the water. 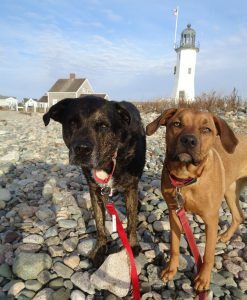 I was cautious of Shadow and Wilma going too far into the water due to the many danger signs, but we still did enjoy strolling along the shore, with just our toes (well sneakers) in the water. The water created lovely patterns in the sand, almost a song of its own. The waves were peaceful, and completed the sounds of this beach oasis. Today we Adventured to the Highland Lighthouse in North Truro, Massachusetts, part of Cape Cod. The Highland Lighthouse, which is also referred to as Cape Cod Light, is an active lighthouse and is the oldest and tallest lighthouse in Cape Cod. It was initially built in 1797, however was built again in 1831 and 1857. In season there are tours available and a gift shop. We had a magnificent Adventure to the Highland Lighthouse on a dreary spring day. This Lighthouse does not disappoint as the view is almost immediately stunning! We had visited previously about three years ago with Shadow, Buster, and my Mom. Today’s Adventure began by walking down the path toward the Lighthouse. It was raining and we were pleased to see few other visitors. We arrived at the Lighthouse to take in the view, and then looped around and past checking out the other side. The path ended at a deck-like area with views of the ocean. Both Shadow and Wilma enjoyed some rolls in the grass and appeared pleased with this special location. We took our time, noticing the little details, including some budding branches along the path. The interesting twist to the Highland Lighthouse is that it is surrounded by a golf course requiring that you stay only on the assigned trail. We were glad that there were no golf balls flying over our heads, so that we could concentrate on the Lighthouse. The Highland Lighthouse is one of the most beautiful Lighthouses I have ever seen. Definitely do not miss it if you are in Cape Cod (Rating: 5). Today Shadow, Wilma, and I Adventured to Holmes Reservation in Plymouth, Massachusetts, a property of the Trustees of Reservations. This conservation area is an open grassy area with no official trails or paths. It is known for views, the abandoned tracks of the Old Colony Railroad, and a beach. It was part of the “Muster Ground” for the Plymouth militia during the American Revolution. We had a rainy, and short Adventure to Holmes Reservation, a stop on the way to our main destination. Our visit began with a stroll along the along the railroad trail, a paved trail perfect for a bike ride or a run. We quickly became waterlogged, but carried on determined to explore this new destination. We quickly located a trail to the beach and veered off in that direction. The beach was beautiful, covered with rocks, and providing lovely views. There was even a lighthouse off in the distance. We walked around the beach for a bit, the scenery helping to mask the dreary weather. After spending some time on the beach we headed back over to the open field and wandered around the property. The grass was bright green, and scattered with various birds including seagulls and Canada geese. Wilma had a couple head turns with the sites and sounds, creating a humorous moment. We walked around a bit making sure we could stretch our legs before heading on our journey. Glad to visit Holmes Reservation, and although a short visit we seemed to cover the entire property. If you may be wondering, I located the Old Town Hill through the Trustees of Reservations which I have been learning about in the last several months. I would encourage you to check out the Trustees of Reservations, as you can search for properties in your area. Many of the land, trails, and properties are absolutely lovely, and the Trustees of Reservations does wonderful work to preserve the land and history throughout Massachusetts. It is unlikely we will be back, but gad we visited Holmes Reservation today (Rating: 3). In the Spring of 2017 Shadow and I had an Adventure in the world of Dog Agility, participating in a local class. Buster had just passed in October and we were still sad and adjusting to life without him. I thought it would be fun to try something different, so why not sign up my extra-large nine-year-old dog for Agility! The goal was to have some fun and try something new and that we sure did! Shadow absolutely loved the class, I think he thought of it as time to EAT as numerous treats were provided as a reward and to encourage activities. Shadow was able to pick up the equipment quickly, impressing me with his skills. It was really a fun experience for both of us. Below you will see a short beginner video of one of our sessions. Due to his age the instructor recommended we skip the tall equipment and high jumps, so tunnels, low jumping, and zig-zagging it was! Shadow put in amazing effort to get those treats! One unexpected result of the Agility class was that I became a bird-mom, yes a bird-mom. The Agility Instructor happened to be fostering birds for the MSPCA and next thing I knew I had adopted two baby budgies, Sanibel and Sky. I had thought about birds for awhile, and would have never guessed that Agility would open the door for an adoption. Sanibel and Sky have added lots of color and sweet songs to our lives. Although not always easy to photograph I did my best and included a couple below.